I would like more information about 11 Jimmy Mark Place. Addnl Marketing Remarks: Ideal for your personal beach escape or an incredible investment opportunity, this exquisitely maintained floor plan consists of King size in-law/guest suite downstairs w/ ocean views and access to the pool lanai. The expansive kitchen is perfect for entertaining with a built in wet bar, granite counter tops, high end appliances, solid custom cabinetry, and a walk-in pantry. From the kitchen you are able to enjoy ocean views as well as the vaulted great room with gas fireplace. The downstairs boasts a large convenient laundry and office space, a powder room, and 2-car garage. The upstairs features a split floor plan with 2 large bdrms and jack-n-jill bath. The owner's suite is separated from the rest of the upstairs living area by a reading nook and built-in shelving, as well as a front balcony which is perfect to watch the sun set over the intracoastal. The impressive master suite w/ panoramic ocean views has 2 large walk-in closets, whirlpool tub, water closet, and massive walk-in shower. An extensive 2nd floor owner's balcony immediately off the master suite has a spiral staircase leading to the pool area. The Oceanfront pool and spa w/ new paver decking is ideal for relaxation. This .52 acre property located on a cul-de-sac at the end of a private road w/ plenty of space for parking has a great RENTAL history. 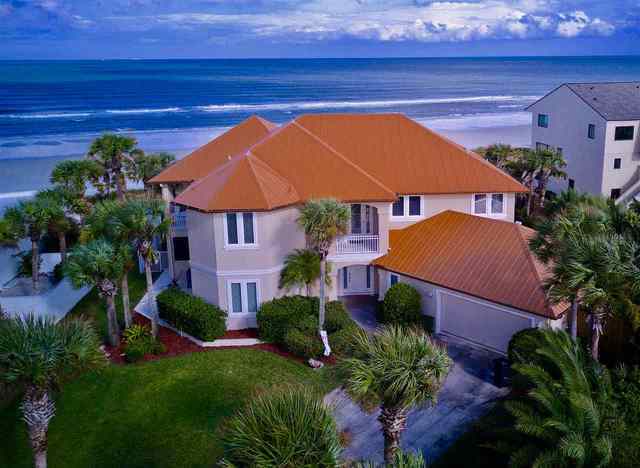 Beach walkover is steps from your back screened porch complete with outdoor kitchen equipped with brand new grill. Your personal paradise awaits! Directions: From St. Augustine Beach take A1A South past SR206. Left onto Jimmy Mark Ln just before Summerhouse Condos. From St. Augustine take US1 South and turn Left at SR206. Turn right onto A1A South and continue approx 5 miles. Turn Left onto Jimmy Mark Ln just before Summerhouse Condos.